IT'S NATIONAL LEMON MERINGUE PIE DAY! Two of the best things about lemons are Lemon Meringue Pie and lemonade. With the Lemon Meringue Pie Martini you get both in a cocktail, it's a total lemon win/win! The use of egg white in this martini gives it the fun frothiness of the meringue and you can use pasteurized egg whites or even egg white powder in place of fresh egg white if you choose. For a little extra pie goodness try riming the glass with baked pie crust mixed with some sugar. Lemons have been cultivated in the Mediterranean from as early as the first century A.D. 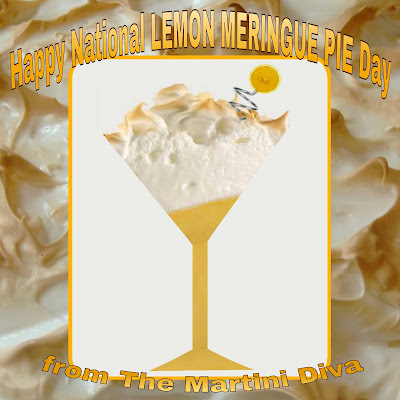 So, when life hands you lemons, make a Lemon Meringue Pie Martini!